This is a group of five essays in very near to accepted designs. Handpainted in watercolours, with white and black Letraset for wordings and QEII portrait inset. The essay is mounted on card 9x12cm. 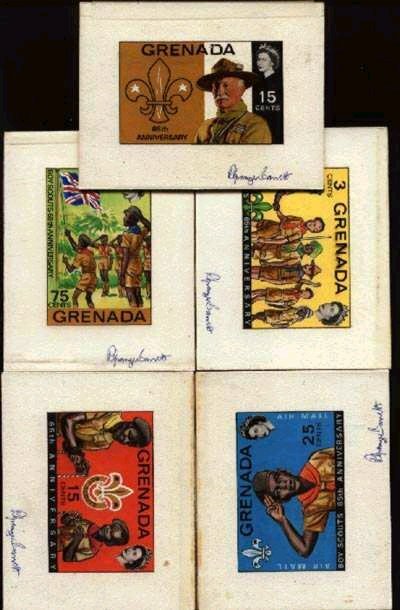 Each card was signed by the designer, R. Granger Barrett. 1) Baden-Powell design as used for 3c & $1 excepting brown field at left and inscription reads only "65th Anniversary" (omits "Boy Scouts"). 2) Scouts knotting ropes as for 1c & 35c but artwork is for 15c. 3) Scout saluting as 25c & 1/2c incl "airmail" inscription. 4) Scouts shaking hands as for 2c & 75c but showing 3c duty. 5) The unaccepted design of 75c Union Jack flag-raising.